When I go out with a female friend for a long lunch, a leisurely drink, or a hike across a nearby lake, I can expect to come back with a new scheme. A business venture, a new product, a book, a campaign for a cause, or something will come out of it. It may not stick; it usually doesn't. But let two women dish for awhile and they're going to get into trouble. So it must have been when Heather and Julie went on a camping trip together and cooked up Diva Chocolate Grilling Rubs. The baked brownie and marshmallow could not be cut and served from the pan, the Divas recall, and they sought whatever was around to help save and savor the barbecued goo. Whatever was around them, Heather and Julie dipped in the goo; the tortilla chips, the lettuce, the potato and, yes, the London Broil.... It was all good; especially the chocolate marshmallow with barbecued London Broil. That evening Julie and Heather proved that, "Chocolate could - and should - be eaten with anything." 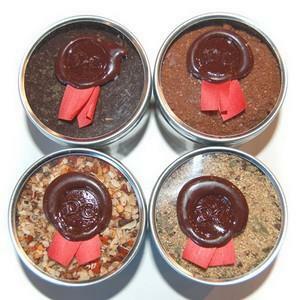 And now, to the credit of these daringly dangerous ladies, Diva Chocolates produces Mocha Java Steak Rub, Orange Chocolate Chicken Rub, Spicy Cocoa Rib Rub, Kickin' Chocolate Beef Rub, Cranberry Cocoa Bean Rub, and Cocoa Fennel Burger Mix. If none of those appeal to you, there's the Chocolate Beef Jerky, or the varieties of hot chocolate, or the chocolate fondue. Are you ready for these? Visit Diva Chocolates. The Traveling Notebook Barbecue Grill: Great For Camping!